Camille Pissarro and his eldest son Lucien headed an artistic dynasty which spans France and Britain, Impressionism and Post-Impressionism. Energetic, generous and influential, they were at the heart of their own cultural circles and also international in outlook. Camille Pissarro (1830-1903), born in the Danish West Indies into a mercantile, Sephardic Jewish family, embarked on his career as a painter in Paris in 1855. From the 1860s he was associated with the Impressionists, particularly Renoir and Monet, who was a fellow refugee in London during the Franco-Prussian War of 1870-71. He showed paintings in the notorious first Impressionist exhibition of 1874 and in all seven subsequent shows until 1886, the only member of the group to contribute to every exhibition. 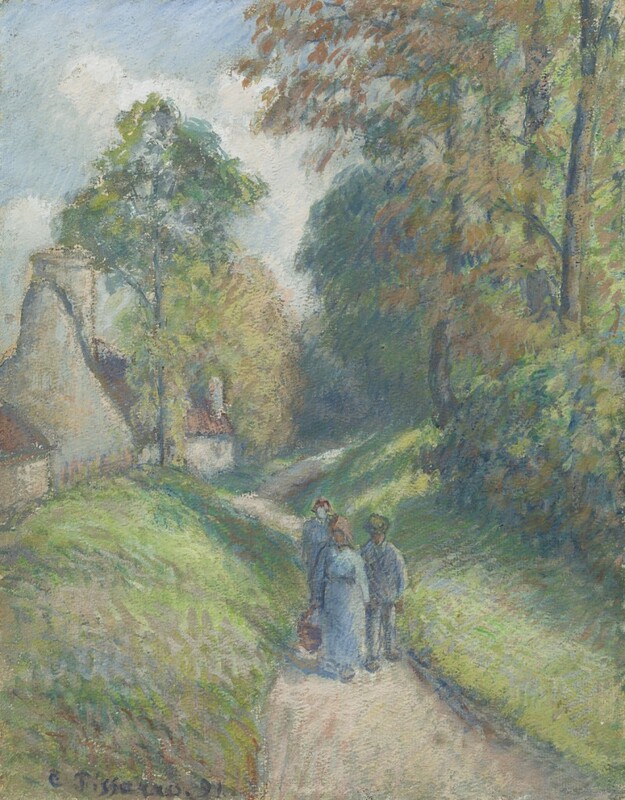 Pissarro lived in the country town of Pontoise in Normandy from 1872 to 1882 and in 1884 settled in the village of Eragny-sur-Epte, fifty miles north-west of Paris, where he was based for the rest of his life. Four of Camille’s paintings in the exhibition are rural landscapes, reflecting his fascination with light and changing seasons, and the dignified, hardworking peasants who were his neighbours. An Anarchist by political conviction, Pissarro despised the greed and class conflict symptomatic of industrialisation and hoped for a world where the fruits of the earth and human ingenuity could be shared. Femme bêchant (Woman digging), 1883, reflects Pissarro’s increasing interest in figure subjects from the beginning of the 1880s, when rural labourers become the main focus rather than being staffage in a wider landscape. It also marks the evolution of his technique from the free, painterly brushstrokes of the Impressionists towards small, evenly distributed and carefully controlled touches of paint. The woman digs with easy fluency, at one with the landscape, rather than oppressed by her task. The subject is inspired by the fact that Pontoise was an area of smallholdings, specialising in growing vegetables and fruit for the burgeoning cities. Paysage avec trois paysans (Landscape with three peasants), 1891, La gardeuse d’oies (The goose girl), 1901 and Dans le pré en automne à Eragny (In the meadows in autumn at Eragny), 1901 were all executed in Eragny-sur-Epte, where Pissarro had an idyllic house with a garden and meadows overlooking the shallow, verdant valley. 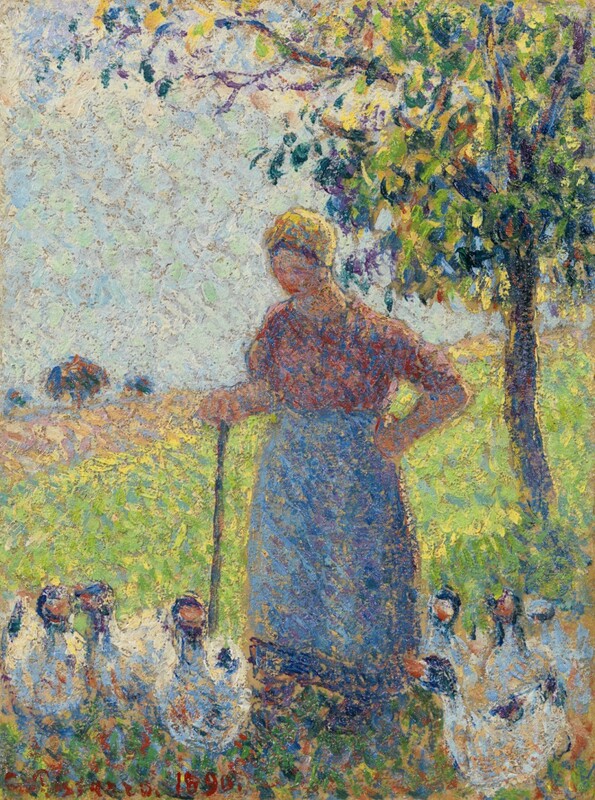 The three Eragny pictures demonstrate Pissarro’s versatility with different media and the questing, experimental spirit which he retained to the end of his life. 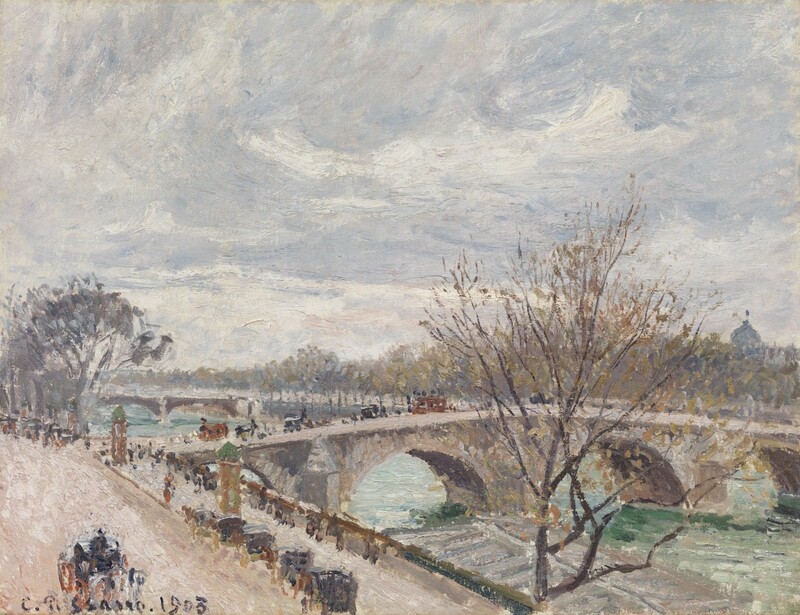 Camille was also a brilliant painter of urban landscapes, as can be seen with Paris: Le Pont-Royal, après-midi, temps couvert, 4e série, painted in 1903. The artist set up his easel in a hotel on the Quai Voltaire and surveyed the sweep of the river and its bustle of horse-drawn traffic, evoking the grandeur and energy of the capital in a palette of silvery greys, beige, eau-de-nil and ochre: nature and man in harmony on a blustery day at the edge of spring. Lucien Pissarro (1863-1944) was despatched to cousins in London in 1883 to improve his English (which Camille spoke well) and to follow his practical mother’s wish for him to embark on a business career. As had happened with his father, the lure of art proved too strong. Lucien was back in France the following year, studying wood engraving, training with Camille, discussing a ferment of artistic ideas with Signac, Seurat and van Gogh. 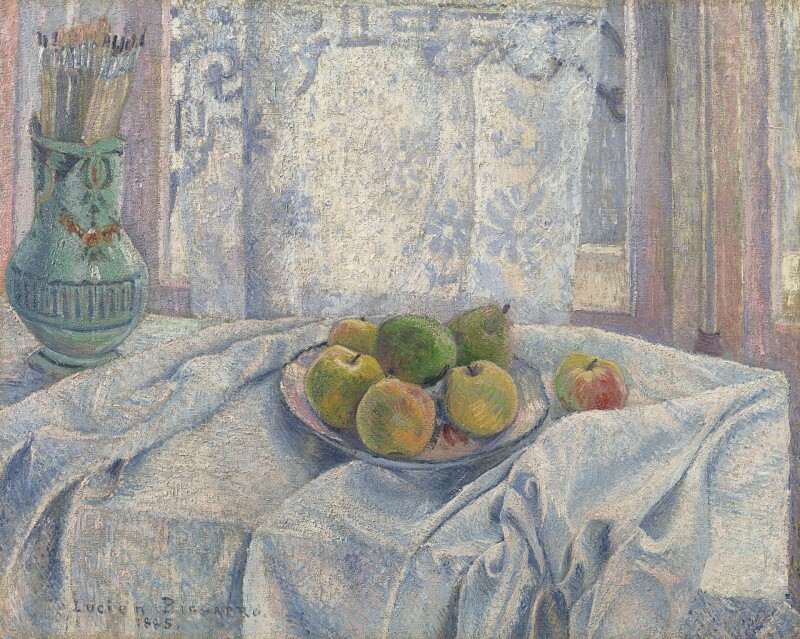 Apples on a tablecloth against a lace-curtained window, 1885, is a masterpiece of the twenty-two-year-old Lucien’s French years, exploring elements of Divisionism and Neo-Impressionism in the boldness of its composition, its simplification of forms and the flattening of the picture plane. 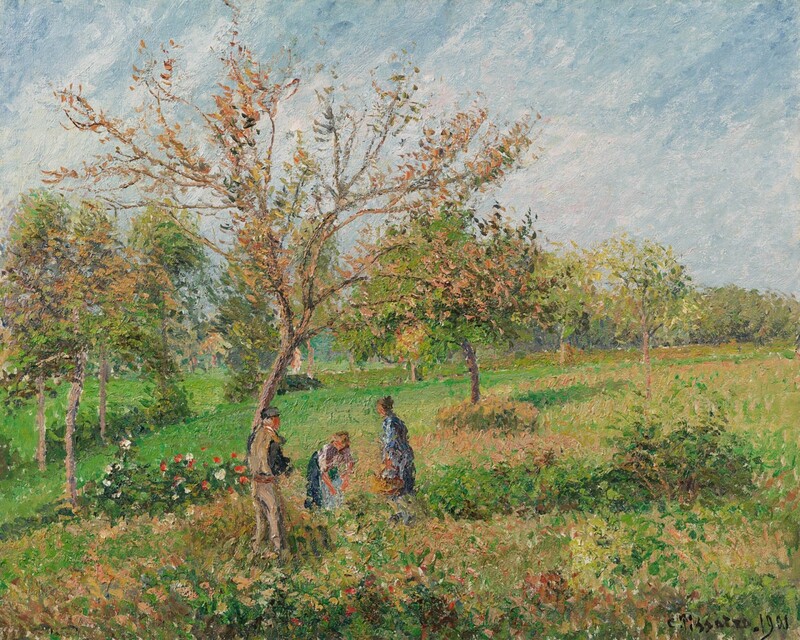 In 1887, van Gogh paid homage to this work with his own Basket of apples (Kröller-Müller Museum, Otterlo), dedicated ‘à l’ami Lucien Pissarro’. Lucien moved permanently to London in 1890, marrying an English artist, Esther Bensusan, in 1892. In 1894 they founded the Eragny Press, specialising in wonderful illustrated books. As a member of the New English Art Club, Fitzroy Group and Camden Town Group, Lucien was the catalyst for the introduction of Neo-Impressionism to England, influencing artists such as Spencer Gore and Harold Gilman. Like his father, Lucien had a deep understanding of landscape painting, taking as much delight in the English countryside and suburbs as he did in French landscapes on visits back to Eragny. 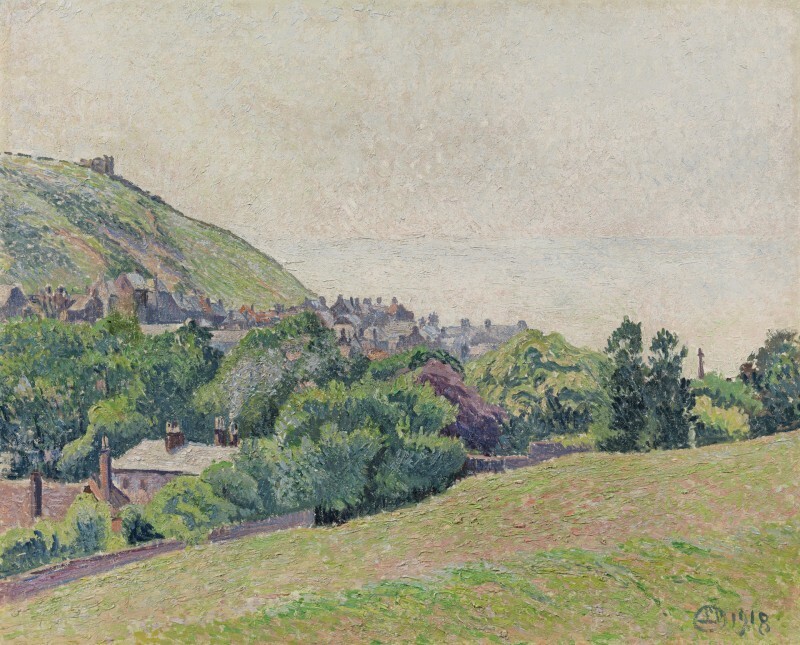 East Hill and Old Town, Hastings, 1918 and Blackpool cottage, Dorset, 1921 show his subtle use of colour and strength of composition, which led the contemporary art critic Frank Rutter to comment that he was ‘equally distinguished as a colourist among designers and as a designer among colourists’.